EDIT: Chulo has now closed, with Chris and the team focusing their energies on Taco Taco (and the newest addition to their family!). 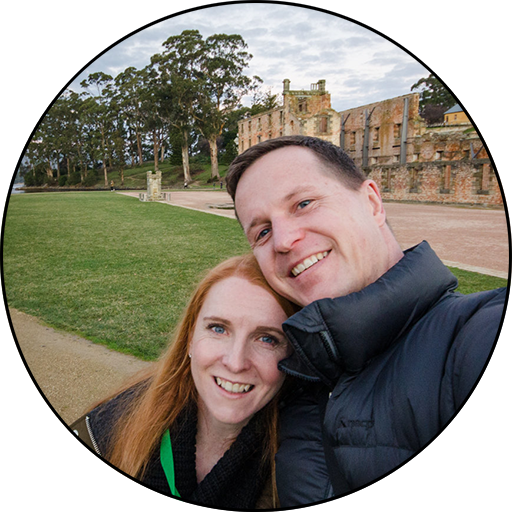 Over the last year or so the residents of Hobart would have noticed the Taco Taco food van parked in odd places at odd times, surrounded by hungry patrons on milk crates, licking their chops and excitedly consuming all manner of Mexican food. 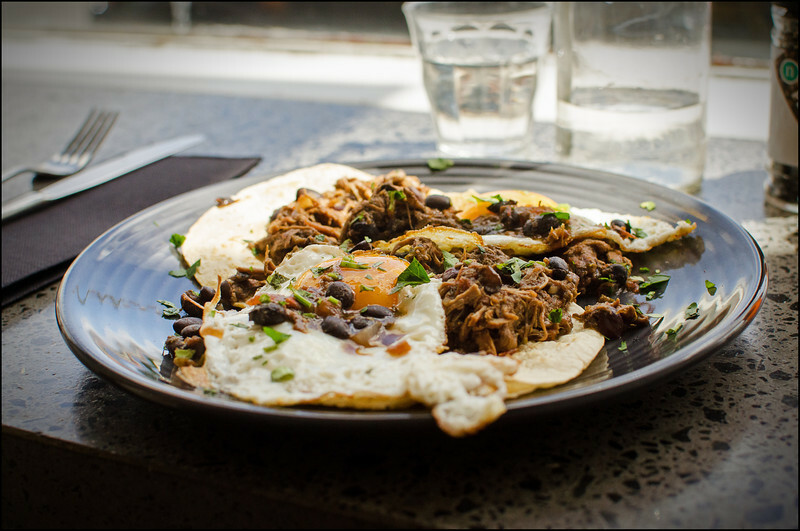 Unfortunately, our daily schedule generally doesn’t coincide with the highly variable comings and goings of Taco Taco, meaning we still haven’t tried their tasty (allegedly! ), and very popular meals. In fact the only time I’ve ever walked past their van was a couple of weeks ago when walking to Monty’s for dinner…of course I had to pass up the opportunity! Perhaps I didn’t have my ear close enough to the ground, but the announcement of the opening of Chulo came from absolutely nowhere! 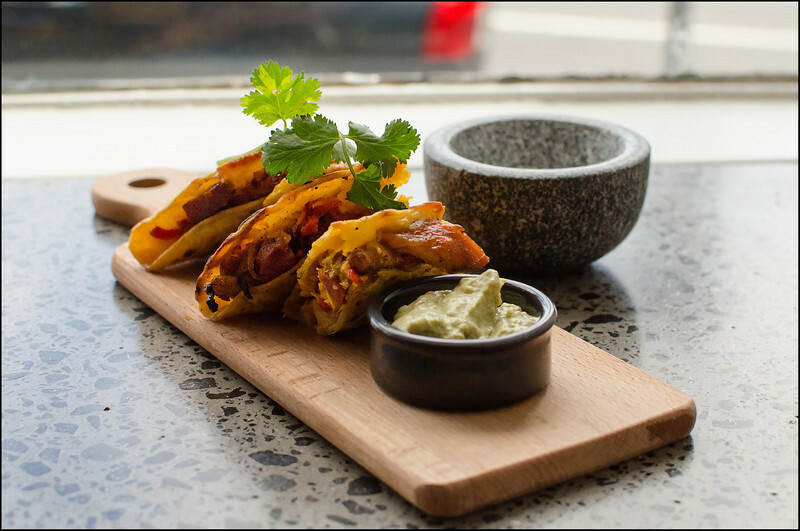 To provide a more permanent presence to their patrons, the owners of Taco Taco have bought out the old Muse cafe at 98 Patrick Street and are now providing their Mexican dishes in the more traditional style. Chulo! Love those bright yellow tables and chairs. So what’s with the name ‘Chulo’? While Chulo DOES mean ‘handsome/cute/good looking’ in some regions of the Spanish speaking world, it was the definition that popped up on Google that was of much more interest to me! Let’s just put that to the side shall we, and focus on the food? 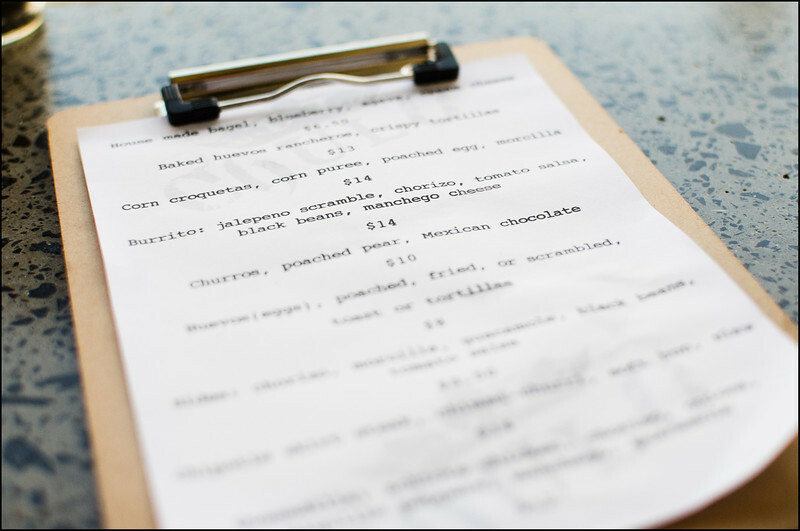 The menu has some good variety, ranging from the ever-popular huevos rancheros (ranchers eggs) to the more traditional burrito (jalapenos, chorizo, black beans, cheese and more), to the very tempting churros with poached pear and Mexican chocolate!! For Karen it was the huevos rancheros with pulled pork (one of the daily specials), while I chose the quesadilla. This was one very tasty breakfast!! The eggs could not have been prepared any better and, incredibly, actually beat those that we recently tried at Pilgrim! The pulled pork was warm and full of hearty flavour, but I did think it was ever so slightly on the watery side. Underneath all this was the crunchy tortilla acting as a fantastic foundation to the other ingredients. While the photo only seems to show three pieces, I did actually get four, and I found that by the end of the meal this was the perfect size to set me up for the rest of the day! The combination of soft melted cheese, achiote chicken, chorizo and onions pulled together beautifully. ‘Comfort food’ at its finest! Unfortunately I do think it was lacking a little bit of ‘zing’, with no spice or sourness to be found. 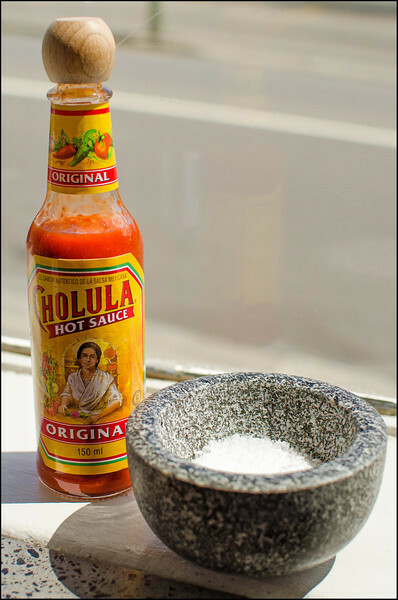 I did try adding some of the complimentary Cholula ‘Hot’ Sauce, but to be honest it didn’t help. Fruity, yes, but hot, most definitely not! Personally, I’d be trying to add a little bit of heat to the chorizo. The ambience of Chulo isn’t warm by any means, with long tables and a concrete window ledge providing clean and modern, yet slightly stark lines to the interior. As an homage to their ongoing mobile exploits the milk crates on wheels (as seats) were a great touch and the service couldn’t be faulted. 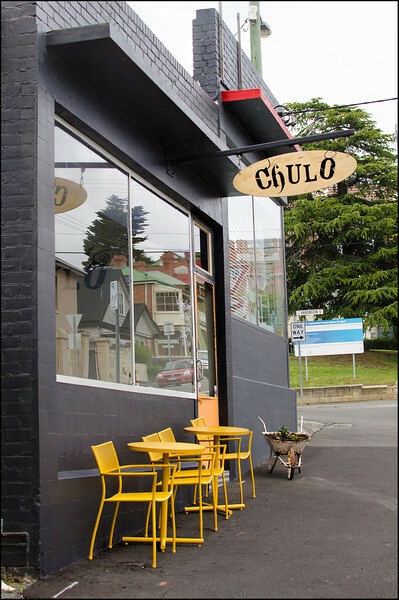 Mexican is done particularly poorly in Hobart, but with the arrival of Chulo I’m hoping to indulge a lot more frequently in what I consider one of the most exciting cuisines in the world! Yes there is room for improvement, but I have every confidence that Chulo will go from strength to strength.